In a braiser or sauté pan, brown the lamb all over in the olive oil, along with the garlic and rosemary, over lively heat. Season well with the salt and pepper, after the lamb has had a chance to brown. Remove the garlic and rosemary. (Or leave them in if you like, for a more ‘rustic’ dish.) Add a splash of white wine and let it evaporate, turning the lamb so it is nicely coated as the wine reduces. If using fresh tomatoes, it’s best to skin them and remove the seeds. Slightly char the skins over an open flame as you would a pepper. The skin can then be easily slipped off. Cut the tomato in two and scoop out the seeds inside. Then roughly chop the flesh. Add the tomatoes to the pan, lower the heat and cover. Let the lamb braise for a good hour, or until the lamb is nice a tender and the tomatoes have melted and reduced into a thick, dark sauce. 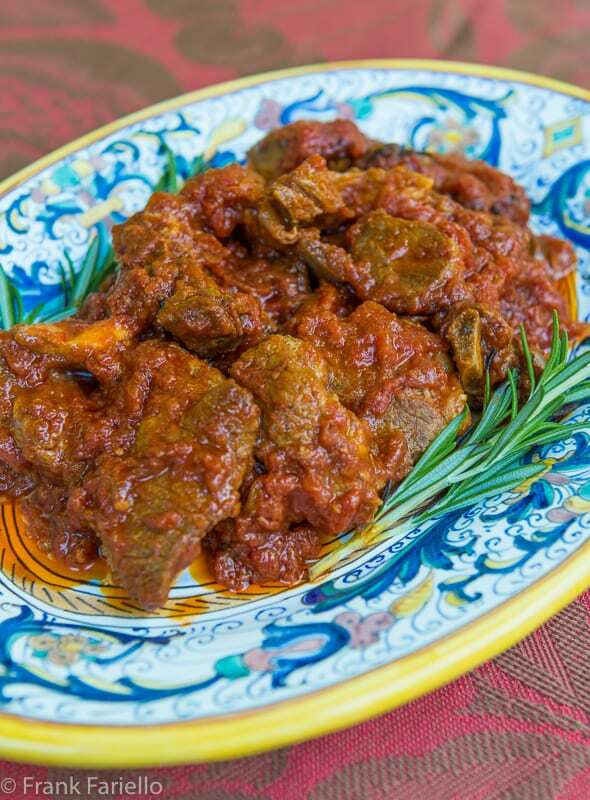 This recipe for Lamb in Tomato Sauce is a slightly modified version of a recipe from Ada Boni’s iconic Il Talismano della felicità for a dish she calls agnello in potacchio alla marchigiana. (Her recipe is from the Le Marche region, but some sources call it typically Sicilian—go figure.) I’ve made a few adjustments to her recipe. She calls for mincing the garlic and rosemary together and sautéing them in the olive oil before adding the lamb. To my mind, that risks burning the garlic so I brown the garlic whole and remove it. She also tells you to braise the lamb for two hours, which with modern lamb at least, seems excessive to me. I think the best cut for this dish is the shoulder, as it stands up well to long, slow cooking. I particularly like taking shoulder chops and cutting them into pieces. The chops have both fat and bone for extra flavor. But in a pinch, lamb ‘stew meat’ or boneless shoulder will work just fine. You could use boneless leg of lamb, but in that case I’d reduce the cooking time considerably. Leg is rather lean, so it tends to dry out. Other versions of this dish call for starting the dish with a proper soffritto of finely chopped onion or shallots, and perhaps a bit of carrot, rather than the garlic cloves. In this case, the rosemary can be minced finely, too. Potatoes can be added to the sauce while the lamb braises for added heft. In a braiser or sauté pan, brown the lamb all over in the olive oil, along with the garlic and rosemary, over lively heat. Season well with the salt and pepper, after the lamb has had a chance to brown. Remove the garlic and rosemary. (Or leave them in if you like, for a more 'rustic' dish.) Add a splash of white wine and let it evaporate, turning the lamb so it is nicely coated as the wine reduces. If using fresh tomatoes, it's best to skin them and remove the seeds. Slightly char the skins over an open flame as you would a pepper. The skin can then be easily slipped off. Cut the tomato in two and scoop out the seeds inside. Then roughly chop the flesh. I love everything about this dish, including the lovely dish you’re serving it on. I especially like the idea of using the leftover sauce as a pasta dressing. Gee, thanks, Jeff! The sauce really is good. Sheesh, that is hot… Do try to keep cool. Sounds like nice weather for gelato—and a dip in the pool! Yes, this is simole Frank, and one of the reasons I think traditional Italian food is so good – its simplicity. I will definitely be trying this soon! Excellent recipe Frank. For some strange reason we haven’t cooked lamb in tomato sauce before:) We mostly cook it kleftiko style or grill some lamb chops in the bbq. Loved your delicious idea! Beautiful. I love lamb also, but my husband won’t eat it. I’ve snuck it into minced kabobs and he didn’t notice so I really think he’s just made this up. But unfortunately, except for an occasional chop I can buy at our grocery store, I really can’t buy lamb and make a wonderful recipe like this. We also eat a lot of lamb, and love it, but never in umido. In fact, since our son gave us quite a bit of deer meat I wonder if this recipe would work with some of the cuts? The slow cooking with the tomatoes I think would make the meat tender and flavorful. Thank you for the idea. Buona Dominca! You’re welcome, Marisa! I’m no venison expert, but I bet it would be nice made this way so long as you use a cut that’s not too lean, so it stands up to long, slow braising. Buona domenica anche a te, Chiara! I cook lamb in many forms, but I’ve never tried making it in umido. This looks delicious and like something my whole family would love. I bet your family would like it… almost anything tastes yummy in umido, don’t you think? I eat very little red meat, but how I love lamb! It is easy to find just about any part of a lamb here, between the Italian butchers, the Maghrebi ones and others from round the Mediterranean (and Portugal, which isn’t technically Mediterranean). My favourite nearby butcher’s is Moroccan; all the lamb is local; they also have heart, liver … and testicles. Neck is also excellent for this dish, but a bit trickier to eat unless you bone it before serving. As for regions, I’ve had this made by people from gli Abruzzi (Abruzzo-Molise) the region(s) many italomontrealesi hail from. But it lies just south of Le Marche. By the way, if any of you have vegetarian friends, eggplant are also wonderful done this way, with a shorter cooking time, of course. We also have a halal butcher in these parts who sells very nice lamb—although thankfully you can usually find it in supermarkets, too. Lucky we are, as there are areas in the US where lamb is considered “exotic” and hard to find! Nice recipe Frank. I usually cook beef in tomato sauce, I should try lamb. Worth a try, Paola. Makes for a nice change. Lamb is probably my favorite red meat too (I might be able to be talked into goat). It’s odd, don’t see that much shoulder in my markets these days — it’s mainly chops and leg. I think you’re right that for a nice braise like this you really need shoulder. Nice dish — thanks. Thanks, John! Shoulder is, unfortunately, unappreciated, but it’s my favorite cut. So flavorful! We make a beef dish with potatoes and bay leaf which is similar, but I’ve never had lamb in tomato sauce, now that I think about it! I think we’d really like this! Enjoy Torino! I’ve been wanting to go but have never been. Looking forward to your posts! It is a treasure… I’m sure a first edition must cost a fortune!